Metal Building Depot Building System's window is an extruded aluminum frame unit designed specifically for metal building use. 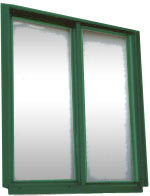 The window comes completely assembled for ease of installation. The window is self-flashing. The head and sill trim are factory attached to the window frame. The universal jamb pieces are "snapped" in place without the use of fasteners and work well with all Metal Building Depot standard panel profiles. The window frame features a ¼" polyurethane thermal barrier and the windows are glazed with ¾" insulated glass. The window finish is prime painted and finished with a white paint. The windows are individually crated for shipping. Special window sizes and other types are available from Metal Building Depot on special order for additional cost and possibly longer delivery.